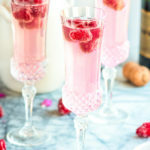 Pour about 1 ounce of raspberry lemonade into the flute (almost filling the flute). Top with fresh sugared raspberries. Enjoy!